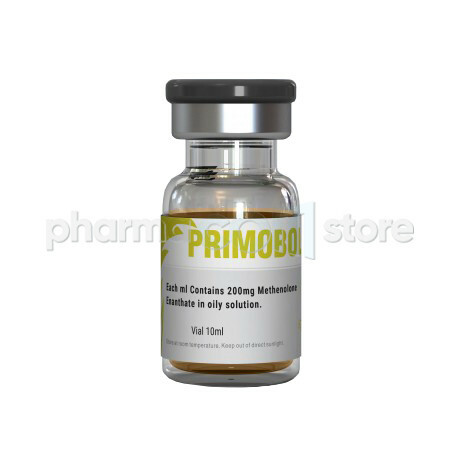 Dragon Pharma Primobolan 200 is presented in a 10-milliliter multidose vial and reportedly contains 200 milligrams of methenolone enanthate per milliliter according to label and/or packaging. The samples were forwarded and received by the analytical laboratory on 02-25, 2019. The lab performed HPLC-UV quantitative dosage testing, ‘total aerobial microbiological count’ (TAMC) testing and ‘total yeast and mold count’ (TYMC) testing. The report was completed on 02-27, 2019. Label claim: Dragon Pharma Primobolan 200 has a label claim of 200 mg/ml methenolone enanthate. 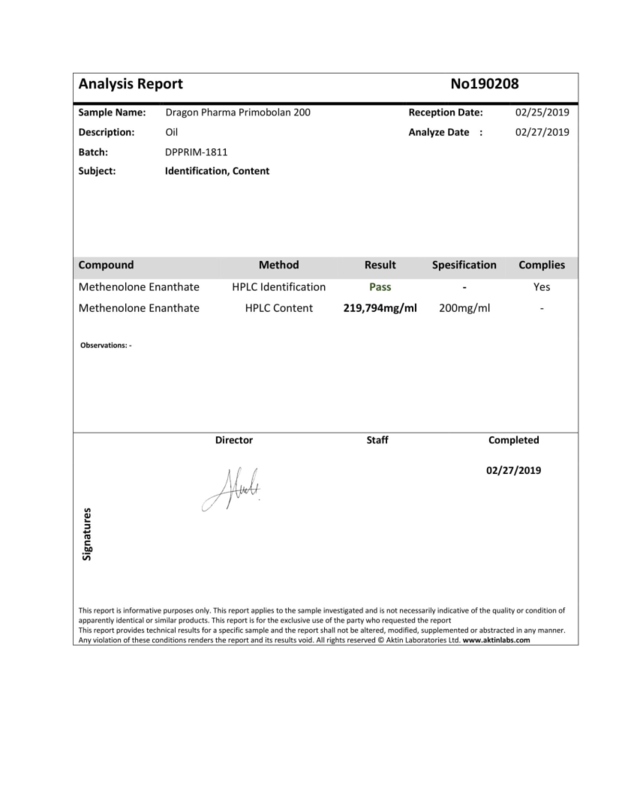 Actual content: Dragon Pharma Primobolan 200 was determined to have an actual content of 219.794mg/ml methenolone enanthate. 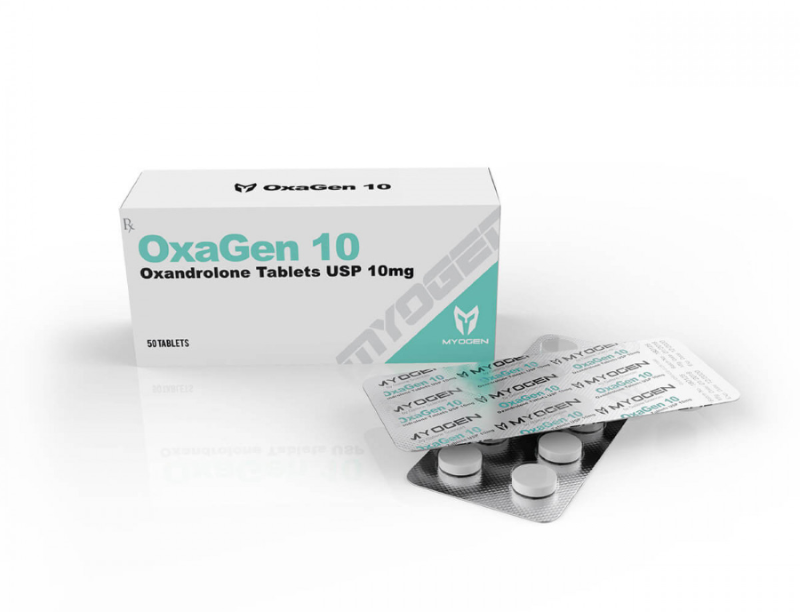 Oxagen 10 is presented in a box with 50 tablets. Each tablet reportedly contains 10 milligrams of oxandrolone according to the packaging materials. The samples were forwarded and received by the analytical laboratory on 03-15, 2018. The report was completed on 03-17, 2018. The product was identified with a batch number of “180224” and an expiration date of January 2021. Label claim: MyoGen Labs Oxagen 10 has a label claim of 10 mg/tablet oxandrolone. 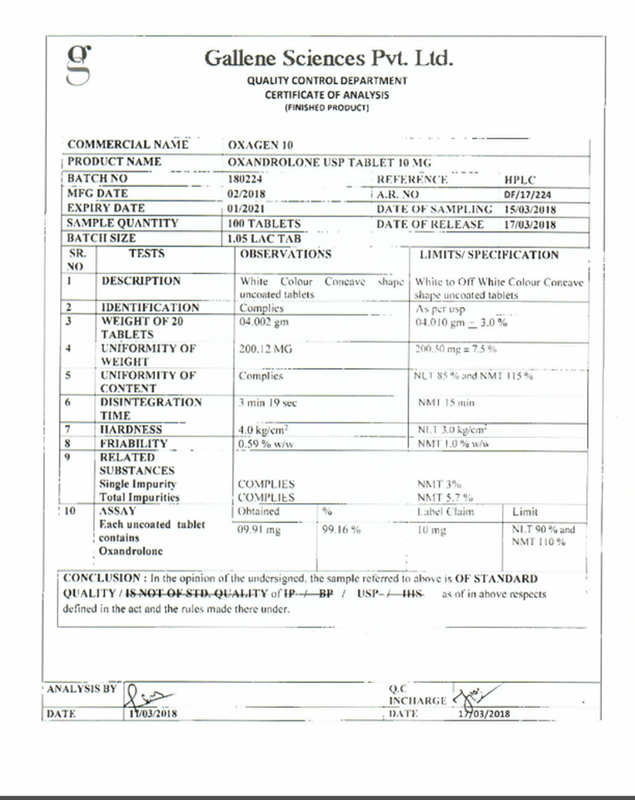 Actual content: MyoGen Labs Oxagen 10 was determined to have actual content of 9.91 mg/tablet oxandrolone. Dragon Pharma Trenbolone 200 is presented in a 10-milliliter multidose vial and reportedly contains 200 milligrams of trenbolone enanthate per milliliter according to the label and packaging. The samples were forwarded and received by the analytical laboratory on 04-07, 2019. The report was completed on 04-08, 2019. 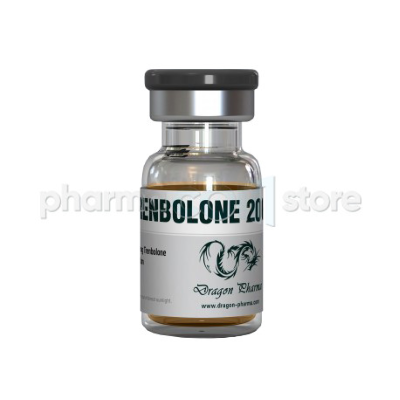 Label claim: Dragon Pharma Trenbolone 200 has a label claim of 200 mg/ml trenbolone enanthate. Actual content: Dragon Pharma Trenbolone 200 was determined to have actual content of 214.19 mg/ml trenbolone enanthate. There was no microbiological contamination. Dragon Pharma Cut Mix 150 is presented in a 10-milliliter multidose vial and reportedly contains 150 milligrams of drostanolone propionate, testosterone propionate, trenbolone acetate per milliliter according to label and/or packaging. The samples were forwarded and received by the analytical laboratory Aktin Labs for HPLC-UV testing on 03-28, 2019. 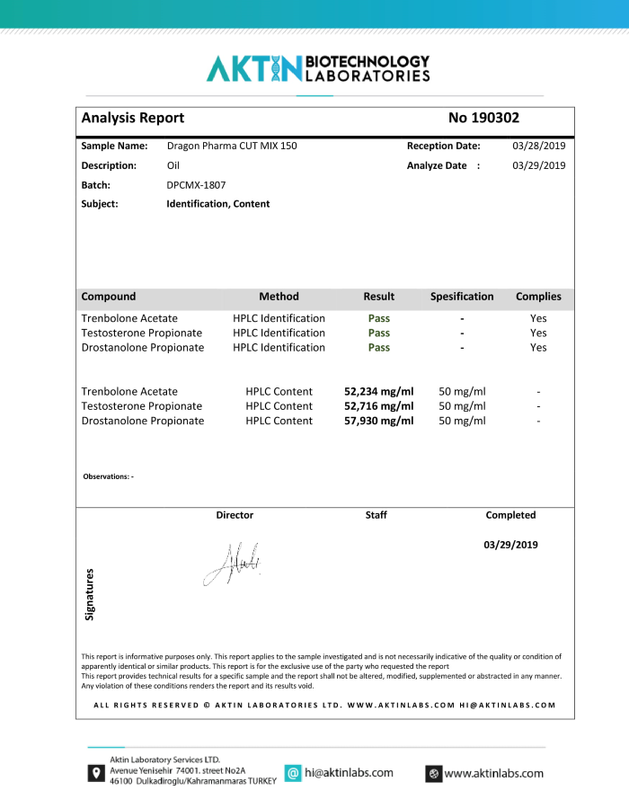 The quantitative dosage test report was completed on 03-29, 2019. Label claim: Dragon Pharma Cut Mix 150 has a label claim of 50 mg/ml drostanolone propionate, 50 mg/ml testosterone propionate, 50 mg/ml trenbolone acetate. 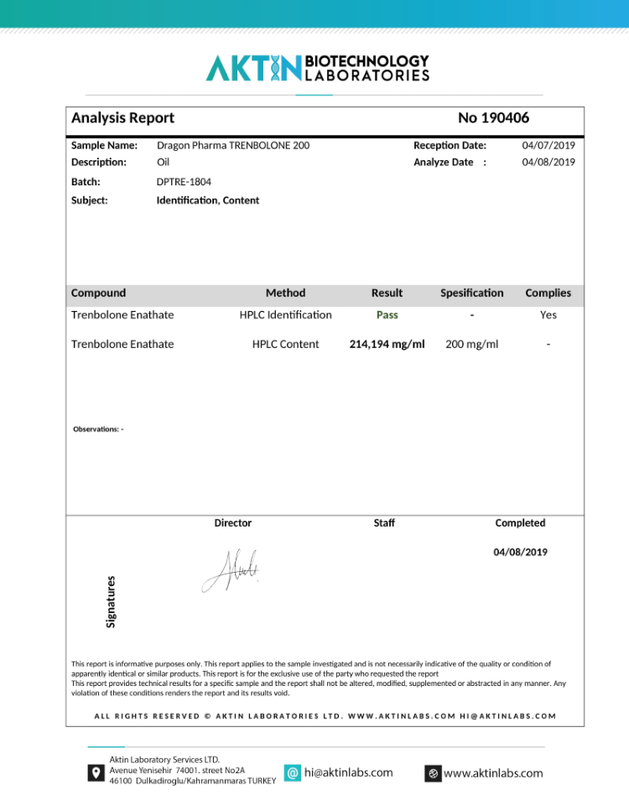 Actual content: Dragon Pharma Cut Mix 150 was determined to have an actual content of 52.23 mg/ml trenbolone acetate, 52.72 mg/ml testosterone propionate and 57.93 mg/ml drostanolone propionate. No microbiological contamination was detected.